The Liberty School Pool as seen recently. The school and pool are closed. A special thanks to Kennedy Baughman for the photo. My elementary school years went fairly smoothly until fourth grade. This is when we were introduced to swim class. My greatest fear would be met head on, and I would lose the battle for several years. Midland school didn’t have a swimming school. Every Tuesday afternoon, we would take a school bus to Liberty school for swim class. The bus ride was the highlight of this most difficult time in my life. The bus driver always seemed quite cheerful and talkative; however, his cheerfulness couldn’t help ease the pain of my worst hour of the week. 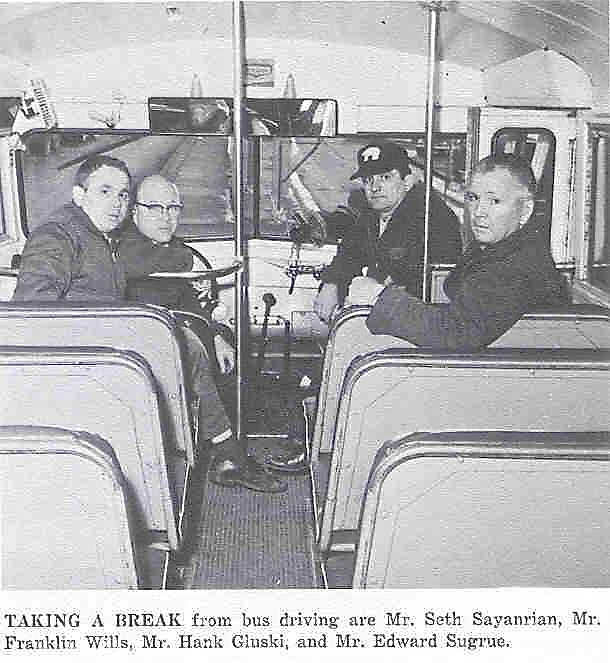 Here are some of the bus drivers. Seth is the one I remembered the most. After arriving at Liberty school, we were introduced to our routine for the year. Mr. Munro, our teacher, told us that we were to totally undress. This was difficult for me because I had never done this before in public. What even made it more difficult is that we were not to wear swim trunks. We would be spending the whole time in swim class in our birthday suits. To this day, nobody has given a satisfactory explanation to this rule. The girls wore swimsuits during their swim time. Why didn’t my parents complain? Why didn’t any parent complain?! Why didn’t some newspaper expose the practice? I can’t imagine this happening today. After we took off our clothes, Mr. Munro told us that we had to shower before we entered the pool area. After the shower, he would inspect each one of us by rubbing our collarbone area and our wrist. If no dry skin came off, we were good to go. Eventually, we learned that we only needed to clean our collarbone area and our wrist. Now, the worst part would soon come. We were to get into the pool. The pool at Liberty, looking back, was not very large, but it looked like an ocean to me. The largest pool I had ever entered was my bathtub. I would have been quite content if it had remained that way. When I entered the pool, I lived in the shallow end. I may have ventured out a bit with a board to keep me afloat, but I still didn’t go any further than where my head could stay above water. Mr. Munro probably taught many a boy to swim, but I wasn’t one of them. There were many Tuesdays when I would come to school feeling quite well, but by afternoon, I would develop a stomach ache. I wasn’t making this up, I was so afraid of swim class that I would literally get sick. I would be sent to the nurse’s office and she would give me some kind peppermint to settle my stomach. The bus would leave and I was spared one week of agony in swim class. When I arrived at Ford Middle School, I think Mr DeSantis, our swim teacher, took me on as a personal challenge. It seemed like I was the only student in sixth grade who couldn’t swim. Mr. DeSantis tried and tried to get me to leave the float board and start swimming. Soon, he threatened me with an “F” if I didn’t start to swim. Finally, the day came when I actually swam the width of the Ford School pool. I had learned to swim! I avoided my “F”! However, Mr. DeSantis was not done with me. In eighth grade, I had a new challenge. Mr. DeSantis said that I must JUMP into the deep end feet first and hit the bottom of the pool and bounce up and swim the LENGTH of the pool. If I didn’t accomplish this feat, I would receive an “F”. I don’t know how many weeks passed, but every time I would get to the edge of the pool, I would think that I would never survive the JUMP. You also had to know that Mr. DeSantis was a bit overweight. Could he save me if I were to drown? I had even asked him once: “Why gym teachers tended to be heavy?” I do not know what possessed me to do this, but he chuckled and said: “When we were younger we ate a lot and we exercised a lot. When got older we kept eating, but we didn’t exercise as much.” I have not forgotten this lesson in my life. Finally, judgment day came. If I didn’t jump, I would get a big “F” on my report card. With great fear, I looked over the side of the pool. I looked at Mr. DeSantis, who said: “Don’t worry, you can do it.” I don’t know how I did it, but I jumped in and my feet hit the bottom of the pool and I bounced back up and swam the length of the pool. That was the last time I have ever jumped into a pool. Even today, I am not much for the water, but I can swim a few laps in the pool, and maybe swim enough to save myself. I am thankful for Mr. DeSantis and his great patience with me. He helped me to finally meet my great fear and win the battle. This entry was posted in Highland Park Memories, People of Highland Park and tagged Ford Middle School, Highland Park, Liberty School, Midland School, Mr. DeSantis, Mr. Munro, Swim class, Swimming pool by markjemilbooth. Bookmark the permalink. Gary, thanks for sharing your memories of swim class. Obviously, you did a whole lot better than I did. Yet, I did learn. I did the free style eventually and that was it. Also, I forgot to mention checking the ankles, but I don’t remember having that done too often. Ed, thanks for taking the time to read my article. Your description of the shower is right on. I was a bit foggy about this, but you have helped jar my memory. Though the memories of swim class were quite unpleasant, yet I am glad that I did learn to eventually swim. As for the photo, I had to doctor the photo. There are all sorts of desks and other furnishings in the pool. There is a group on Facebook called “Once a Parker Always a Parker” One of the members went through the old Liberty school and took several photos. They are on the site under the heading of photos. Again thanks for sharing your memories! BTW-Did you go to Ford Middle School? When I told my grandson that all our schools had pools, he didn’t believe me. When I told him we swam naked, he REALLY didn’t believe me! I never heard that this ever happened any place besides Highland Park. I liked swimming because it was the only thing we did in PE that I was actually good at. I also liked free swim–every once in a while, we got to spend the whole period just playing in the pool. That was one of the most fun activities in the whole school year. Between the school pools and Camp Rankin, I’m sure that almost every HP kid learned how to swim. Richard, thanks for sharing your thoughts again. I have enjoyed going back and sharing some thoughts of my past while living in Highland Park. Nobody has ever explained the reason why we weren’t suppose to wear swim trunks. How did it happen? Hopefully with confirmation from the internet, your granson will believe you. Any way, I am glad that I eventually learned to swim. Pat, thanks for reading my article and sharing your thoughts. I can’t vouch for the fact that Liberty was one of the best schools in country, but I did enjoy my time at Midland. As for the summer programs, the Highland Park Rec Dept had a top notch program. I spent almost every day during the summer at Ford Park. OK, now from a girl…….as a “chubby” I didn’t look that great in a tank suit, but I would NEVER have survived being naked. I got through steps one through nine just fine, but step ten…jump in the pool head first was my Waterloo ,pun intended. I sat on the edge of the pool for the whole period plus my whole lunch hour. Just me, the teacher and the big, dark, wet, menacing pool. I also was threatened with a failing mark. I never jumped and I failed. Luckely it did not keep me from graduating. I love being in a pool now, but still can’t swim. I float however. Used the 10 steps to sucessfully teach my four children to swim. PS Mr Munro was my Drivers Ed teacher when i was 20, in night school. Margaret, thanks for reading my post as well as sharing your thoughts. Yes, learning to swim can be challenge for many people. Looking back, I am glad for the experiences at HP schools in finally learning to swim. Margaret, I am also glad that you are doing better after your stay in the hospital. I also learned to swim growing up in Highland Park. Beginning in the 4th grade we walked the block from Cortland Elementary school to Ferris Middle to use their pool.We went through the same bare bottom swimming and showering requirements described previously. The swimming class at times was grueling.However by 5th grade practically everyone could swim the length of the pool. We learned to hold our breath, to float, to swim pool widths and finally lengths. We also learned practically every swim stroke known to man.and played water polo and basketball, We dove for hockey pucks in the deep end and played king of the flotation tube. I have 5 siblings that all went to HP schools and we are all good swimmers. This was in spite of the fact that neither of our parents learned to swim. As an African American the statistics say that death from drowning is the second highest cause of unintentional death for young people, and that African Americans drown at a 50% higher rate than the population at large. My now grown children are all swimmers and I am a Scuba Diver now traveling the world to dive with my wife whom I helped teach to swim. So needless to say I am very grateful for my swimming (as well as academic) education received from HP schools. I went from 1st grade through part of my College there. Thanks for your note! It is great to hear that you had a good experience learning how to swim. I did eventually get it, but I can’t swim as well as you. I am thankful for Mr. DeSantis and his patience with me. No one believed me when I told them we swam naked at HP. Unheard of today but I wondered why noone said anything back then. I went to Thomson Elematary and we had no pool and we had to go to Ferris for swimming lesson. When I started HP in 1960 I was all out for learning to swim. Rev Moss, of Springhill Baptist Church, son drowned in the HP pool and we seen it and some of us never got over it. I failed Gym because I refused to go swimming. My parents made a agreement with Mr Shannon the principal that the week I went swimming I would go to gym. So I had gym all through high school. I think the gym/swimming teacher was Mr. Monroe. James, thanks for reading my post and commenting on it. Yes, as you read swimming was also a problem for me. 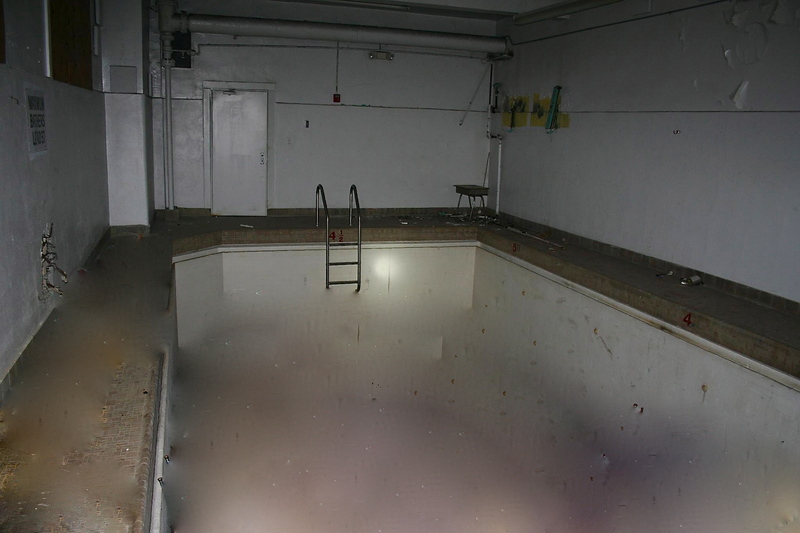 I had never heard about the death in the pool. I also never heard of Springhill Baptist Church. Where was it located? Springhill Baptist Church was located where the Corrininth Baptist Church is now off Caniff 1 block west of Chrysler Freeway. Rev. Moss was the pastor. This was back in the 60’s and 70’s. They moved from there to Greenfield between 7 and 8 mile road. James, thanks for the info. I am a Baptist now, but I wasn’t while growing up in HP. I hope to write about my church experiences growing up in HP some time in the future. Mark, I was looking at pictures of Midland Elementary on Detroiturbex and one thing led to another and I found your blog. I moved to Highland Park from the U.P. in 1967 and moved out in ’69, but I remember vividly some of my experiences there. I went to Midland School for the 5th grade and Ford for the 6th. I lived on Puritan Ave. between Woodward and 2nd. I remember clearly the bus ride to Liberty and Mr. Monroe and swim class. Always thought it seemed a little strange. Now your story confirms that it was. I look forward to exploring your blog further, thank you. Could the teacher had been Mr. Munro? He taught swimming for the Midland students at the Liberty pool. I’m jumping in a few years late because I was looking for Liberty School. I went there from 1958-1962. I am missing the Highland Park that I grew up in. It was like a Norman Rockwell painting. Anyone else want to talk about that time period? I remember so many things! I lived at 50 Brighton St. Thanks for sharing your Highland Park memory!